Today’s recipe was inspired by a fabulous baker named Minnie Mouse. Did you know she has her own bakeshop? She does, and she’s hired some capable help. Minnie’s cookies are produced by Selma’s, and I can’t help but wonder if Selma ever imagined Minnie Mouse would be baking her cookies and selling them all over Disney Parks. The ones at Goofy’s Candy Company in Downtown Disney always seem the freshest, but you can also find them at various gift shops in a multitude of flavors. My favorites are the chocolate chip, which brings me to today’s cookie. This was my attempt to make a cookie similar to Minnie’s (or Selma’s). Gigantic Chocolate Chip Cookies like the Minnie's Bake Shop ones sold at Disney World (formerly Selma's). Small handful of chocolate chips or 1 ½ oz chopped chocolate plus whatever candies you can think of. Be careful using the good high cocoa butter chocolate because it might melt too much into the cookies and cause more spreading. Actual chips and candy pieces seem to work well. Cream the butter and both sugars using high speed of an electric mixer. Scrape bowl. In a second bowl, stir together the egg, water and vanilla. Add the egg mixture to the sugar mixture and beat just until blended. Scrape sides of bowl again. Thoroughly stir together the salt, baking soda and flour. Add to the dough and stir until it’s almost mixed in. Add the chips and candy and continue stirring until flour mixture disappears. Scoop the dough into 4 large scoops. Chill the scoops for several hours on a plate. Bake the cookies. Stack two cookie sheets on top of each other. Set the cookies a few inches apart on the top sheet. Put the cookies in the oven, reduce heat to 350 degrees F and bake for 15 minutes. Pull sheet from oven. Using a spatula, push the cookies inward to make them fatter (taller, less wide). Return to oven and bake for another 3-5 minutes or until cookies appear just set. Don’t overcook! Remove from oven and let cool for several hours at room temperature. Transfer to freezer and freezer for at least an hour or until ready to serve. Thaw and serve. -- One thing you should know is that Minnie uses margarine in some of her cookies. I actually bought a pack of Blue Bonnet to play around with and I’m embarrassed to say I loved the texture of the margarine cookies. If for some reason you are into margarine, email me and I’ll send you that recipe. However, I know a lot of you wouldn’t be caught dead buying margarine so I re-tooled the recipe and used butter. The surprising thing was that the cookies made with butter rose even higher than the ones made with margarine. -- Scoop with a standard size ice cream scoop. 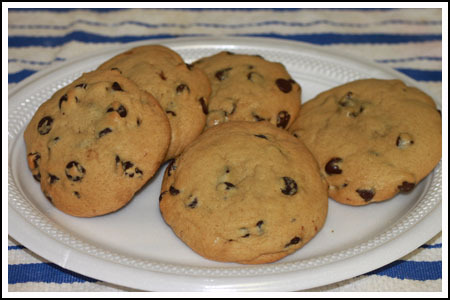 -- Bake cookies on stacked cookie sheets so that the bottom doesn’t get too hot. -- Use plenty of add-ins. -- Chill the dough. The dough that I chilled overnight made the biggest, fattest cookies. UPDATE : Here's a picture of the cookies made with melted margarine. That recipe is in the comment section. The recipe is really simple to whip up. I kept the batch size small and recommend you try making it this size before scaling upwards. If you like this one, you can play around with the add-ins and flavorings. I made these with dark chocolate chips and the new pretzel M&Ms. I haven’t tried using any high cocoa butter candy (regular chocolate as opposed to chips) because I worry it might melt into the cookie too much and cause spreading. I may try that later. What’s special about these is the texture. The outside looks kind of dry, but the inside is dense, moist, and clings together when you pinch the inside. Getting the bake time just right is key, and I think the little trick at the end of freezing the baked cookie does something too. Or maybe it’s my imagination. At least it keeps them fresh until you find someone wiling to eat a ¼ pound cookie. More notes after the cookie. This is it! These are the cookies I’ve been trying (and failing) to make for years! Thanks so much! Actually I’m not so sure this was a favor, seeing as now I’ll be eating WAY too many cookies. I made the gigantic cookies as originally posted. They’re definitely gigantic! They turned out great! Thank you! I may even come out of blogger hiding and post pictures later! Well, enough people asked for it that I’m going to share it ;). And thanks to all of you for helping me not feel like a “heretic” (Rachel, have you been watching The Tudors???) for using margarine. LOL. Here’s the margarine version of the recipe. It’s very similar to the version above, but doesn’t involve creaming the sugar. You mix the dry ingredients, then pour in a mixture of cool margarine, water, egg and vanilla. This recipe makes 4 to 5 gigantic cookies. You might want to bake just 1 first to get the timing just right. For me, about 18-19 minutes at 350 works. The cookies should be slightly underbaked on the inside. It’s important to let them cool completely before serving. Melt the margarine in the microwave and let it cool for about 20 minutes. It needs to be close to room temperature. I’ve cheated and put it in the refrigerator for a few minutes to speed the cooling. When margarine is cool, using a fork, beat in the water, egg and vanilla. Set aside. Mix the flour, salt, baking soda, brown sugar and powdered sugar together in a mixing bowl using the back of the spoon and breaking up the brown sugar as much as you can to remove any lumps. When thoroughly mixed, make a well in the center. Pour margarine mixture into well and gently mix dry ingredients until almost fully blended. Pour in the chocolate chips. Chill dough for about 20 minutes or until it is firm enough to scoop. When dough is thick, use an ice cream scooper to scoop up 4-5 big circles. Chill the circles for at least 5 hours. Bake the cookies. Stack two cookie sheets on top of each other. Set the cookies a few inches apart on the top sheet. Put the cookies in the oven, reduce heat to 350 degrees F and bake for 15 minutes. Pull sheet from oven. Using a spatula, push the cookies inward to make them fatter (taller, less wide). Return to oven and bake for another 3 minutes or until cookies appear just set. Don’t overcook! They’ll still look a little underdone, but that’s how they’re supposed to look. Let the cookies cool for several hours. Also, freezing improves the texture of these cookies. You can skip that step if you want, but I’ve been throwing the cookies in the freezer, thawing them and serving them thawed. Would you share the margarine recipe with me, please? Do you think a recipe using half butter and half margarine would work? Margarine really isn’t heretical; I find it does give the best texture to some chewy cookies. I always keep a pound of Land O’ Lakes in the fridge. High quality margarine–not a watery spread–is the key. Kevin’s favorite M&M’s are the almond ones, too. He always gets a big bag full in his stocking. I bought a 3 lb. bag of the pretzel M&M’s (for the birthday a few weeks ago). They are not our favorite, but kind of fun. Kevin collects M&M dispensers, so we have to try all the new ones that come out. Plain are still my favorite. I’m glad you commented about the pretzel m&m’s. I haven’t seen them yet, and if I get around to trying these cookies I was thinking of subbing some pretzels and regular m&m’s. Now I feel even more okay about doing that. In the recipe you wrote an amount for the chocolate chips. Does that include the amount for all the add ins? I also love m&m almonds above all the others. I recently purchased some pb m&m’s and kept thinking they don’t have as much pb flavor as Reese’s pieces but maybe that’s my imagination? I would also like the margarine recipe. I haven’t seen the M & M pretzels. I’ll have to watch for them. Thanks! I’ve never had the pretzel M & M’s. Will keep an eye out for them in the market. Love your cookie recipe and the inspiration from Minnie Mouse! The bigger the better as far as I’m concerned! I can always fit a 1/4 lb cookie in my life! The texture on these sound really good! Anna, the German Chocolate Chip cookie on the Disney blog looked like it was even bigger than a Levain. Maybe that was an optical illusion. It was so high — not like any cookie I’ve seen before. That is part of the intrigue along with that coconut topping. I totally agree with you — Almond M & Ms are the best! I can’t eat the peanut ones after discovering the Almond flavor because the peanuts always told old, bordering on rancid, to me. I love M&Ms. My favorite are the almond. I even wear an M&Ms t-shirt around town. I have to say, though — the Pretzel M&Ms are not my thing. I didn’t think they had much flavor and buying them made me feel like a big sucker because ounce for ounce pretzels are a lot cheaper than chocolate or nuts and I noticed M&Ms didn’t make the packages bigger or decrease the price. I’d rather just mix half a bag of plain M&Ms with some mini pretzels and throw them in a bowl. The German Chocolate cookie was about the same size. I think the only difference between it and the chocolate chip was dark brown sugar in the dough and maybe some other extracts or flavorings. I like Smart Balance and I Can’t Believe it’s Not Butter baking sticks, but I think those are in a different category than inexpensive margarine. I think both products would work, but I wanted to do my initial testing with the type of margarine I believed mass produced cookies are made with. It would be interesting to see what the Smart Balance and ICBINB cookies are like. Anna, I’m making the margarine version again this morning for a re-test. I’ll either email it to you or post it. I would also like the margarine recipe – I’d love to do a comparison test. What did you think of the pretzel M&M’s? Are they big like the peanut M&M’s? I was going to say the same thing as Laura, only that Smart Balance is trans-fat free as well. Is that not considered margarine? I know you can bake with it if you use the full-fat version. Anna, I take it you are developing this cookie dough also as a base for the German Chocolate Chip cookie? That one is even bigger isn’t it? Like half a pound? Ha! Can’t wait to see what you come up with…. I would love the margarine recipe. My son is allergic to dairy, so we use the earth balance spread. It doesn’t work the same as butter, so I would love to try it with this recipe. Thanks! I love your blog! I’ve never commented before, but I would love to make two requests for some day(s) if you’re at a loss for ideas :). Something like the Mother’s Taffy Cookies. Thanks for making my mouth water on a daily basis! Earth Balance has no hydrogenated oils – or is it not considered margarine? 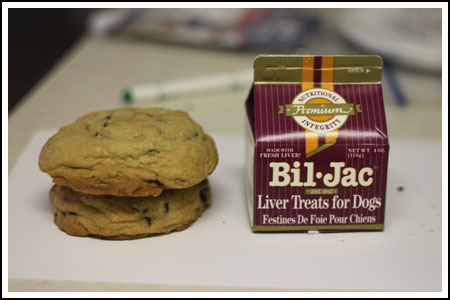 Ummm, Anna, you didn’t slip any of the Bil-Jac Liver Treats (or “Festines du Foie Pour Chiens” as the package says, which sounds *so* much better than “Liver Treats”) into those cookies, did you? I haven’t seen the new pretzel M&Ms, but here’s my question – when I have added regular M&Ms to cookies, they always seem to dry out quite a bit in the baking process, and get hard and somewhat unpleasant. 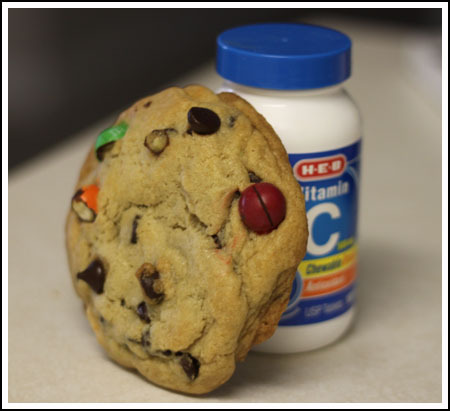 Since I have a bag of M&Ms left over from Christmas, I was thinking of adding them to cookies, but want to avoid the result I’ve had in the past. Any suggestions or comments? While we were in Utah in March, I wanted to make my SIL and her family my favorite ccc’s and all she had was margarine. So I made them anyway, and they actually were pretty good. Shh. 😉 But like you, I just can’t really bring myself to buy margarine, even though that’s also what I grew up on–it’s so cheap! I actually made some cookies with them last week, I just hadn’t posted them yet. These cookies look great. Gotta get me (ok, and the kids, too) to Disney! Just saw on the Disney Food Blog today some huge killer rice crispy treats, too–you’ll never guess how they were shaped? I liked that they were dipping them in all kinds of things with all kinds of sprinkles and such. Yep, gotta get me to Disney! Dani, I have to do some more research on the subject, but I think your margarine might be different than ours. Ours has trans-fat which is why I try to avoid using it. However, back when people thought it was a healthful alternative to butter, margarine was all my mom kept in the house and it was all I ever baked with. I think margarine gives certain baked goods interesting textural properties, but I try to avoid using it these days. I wish they’d make it free of trans-fat, but then I supposed it wouldn’t be the same. They’re big as Minnie’s ears!!! The cookies look HUGE! That Minnie Mouse is one smart cookie to get such talented people to do her baking for her! !